While tablets don’t demand nearly the same kind of attention they once did, especially with Apple devoting much of its time to improving its pseudo-laptop replacement iPad Pro line, these handy little devices can still be pretty useful. However, one problem that gets in the way of wider Apple tablet adoption is cost. Currently, the cheapest iPad you can buy starts at $330. Meanwhile the 7.9-inch iPad mini 4, which was released back in 2015, costs even more at $400. And unlike Apple’s more expensive Pro iPads, neither the standard iPad nor the iPad Mini support the Apple Pencil or Apple’s Smart Keyboard. That’s why today Apple unveiled an all-new iPad, and it’s not just for students like we were expecting. Now before you go and get all excited, this new iPad isn’t actually any cheaper, at least for most people. Like the outgoing model, it starts at $330, however students and schools can get a slight discount that brings the price down to a more acceptable $300. 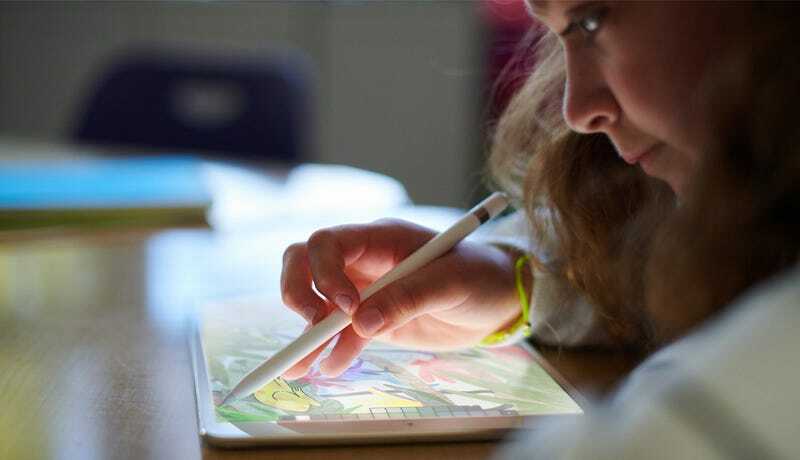 The big change for Apple’s new tablet is that it will finally have full Apple Pencil support, in addition to new “sneak peak” and “smart notation” functions to allow for better note taking. However, on the outside, things are looking pretty much the same, with the new iPad sporting relatively chunky bezels surrounding a Retina Display, TouchID (no face-scanning shenanigans) and an 8-MP front-facing camera. As for the guts, the iPad has an A10 Fusion chip, the same processor found in last year’s iPhone 7 and 7 Plus, along with optional built-in LTE, a claimed battery life of up to 10 hours, and support for various augmented reality apps by way of ARCore. But still, for what seemed like Apple’s big push into education, especially with the company hosting its launch event at a tech-centric high school in Chicago, this new iPad announcement feels a bit lackluster. Sure, the new schoolwork and student-tracking software may help teachers manage their classrooms, and the enhanced privacy measures sound nice too. But the iPad people were really hoping for was a stripped down iPad Pro without the quad speakers or the super-high res screen that still featured stylus and Smart Keyboard support. Even with an updated processor, this new iPad seems like it’s going to have a hard time keeping up with the many low-cost Chromebooks and Chrome OS devices that been gaining popularity in schools. But hey, Apple finally refreshed the regular iPad, and its price didn’t go up. That’s worth something right? If you want one, pre-orders start today, with devices shipping out later this week.